The perpetual twilight during Scotland’s all-too-brief June nights means that the month is rarely a vintage one for stargazing. Indeed, from the north of the country, all but the brighter stars and planets are swamped by the “gloaming” or, for those in the Northern Isles, the “simmer dim”. This year, though, we have two powerful excuses for staying up late. Not only is the beautiful world Saturn at its stunning best, but the two brightest planets, Venus and Jupiter, are converging in our western evening sky on their way to a spectacular close conjunction low down in the twilight at the month’s end. Just expect a flurry of UFO reports. The Sun is at its furthest north over the Tropic of Cancer at 17:38 BST on the 21st, the moment of our summer solstice when days are at their longest over Earth’s northern hemisphere. For Edinburgh, sunrise/sunset times vary from 04:35/21:46 BST on the 1st, to 04:26/22:03 on the 21st and 04:30/22:02 on the 30th. The Moon is full on the 2nd, at last quarter on the 9th, new on the 16th and at first quarter on the 24th. Venus is brilliant in our western evening sky and sets in the west-north-west just prior to our star map times. 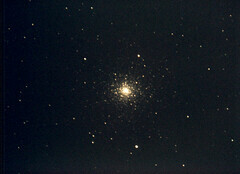 It reaches its greatest angular distance of 45° east of the Sun on the 6th and grows even brighter from magnitude -4.3 to -4.4 – bright enough to be glimpsed in broad daylight. 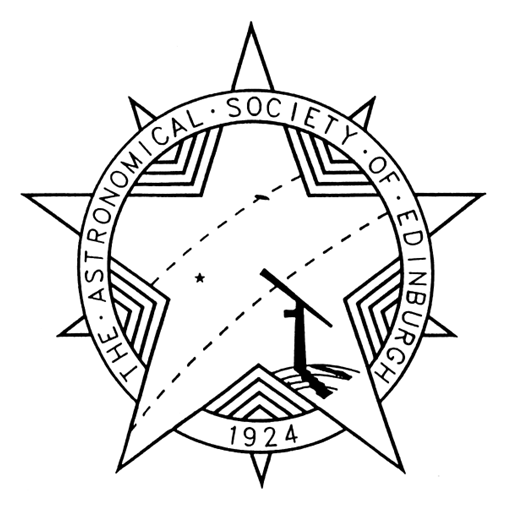 However, its motion against the stars is taking it southwards in the sky so that its altitude at Edinburgh’s sunset plunges from 27° on the 1st to 16° by the 30th. As Venus approaches from 113 million to 77 million km, a telescope shows its disk swelling from 22 to 32 arcseconds across while the sunlit portion falls from 53% to 32%. The planet is said to reach dichotomy when it is 50% illuminated on the 6th, but it seems that optical effects involving its deep cloudy atmosphere mean that observers see the phase occurring several days earlier than predicted when Venus is an evening star. 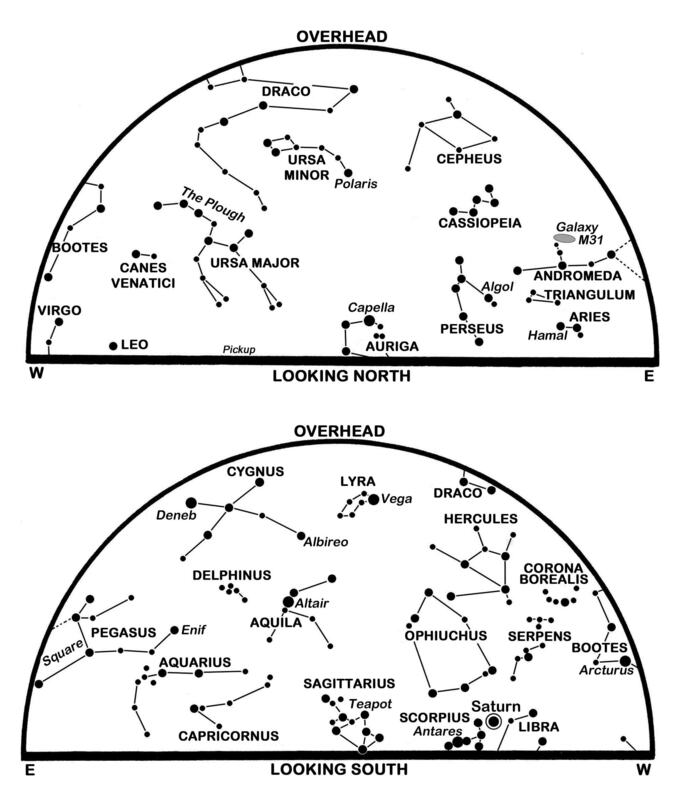 Venus lies below and left of the Castor and Pollux in Gemini as the month begins, but it tracks east-south-eastwards across Cancer and into Leo to pass 0.9° north of the Praesepe star cluster (use binoculars) on the 13th. As it does so, it closes on the night’s second brightest planet, Jupiter, which creeps much more slowly from Cancer into Leo. Jupiter stands 21° to the left of Venus on the 1st but is barely 0.4°, less than a Moon’s breadth, above-left of Venus by the evening of the 30th. The giant planet dims slightly from magnitude -1.9 to -1.8 during the period and shrinks from 34 to 32 arcseconds as it recedes from 851 million to 909 million km. Don’t forget that Jupiter’s four main moons can be followed through a telescope or decent binoculars as they orbit from side to side of the planet. Our own Moon is a 19% sunlit crescent on the 20th when it stands 5° below Jupiter which, in turn, is 6° left of Venus. On the next evening the Moon lies 5° below-left of the star Regulus in Leo which is about to set in the west-north-west at our map times as the Plough stands high above. Mars and Mercury are not observable this month. Mars reaches conjunction on the Sun’s far side on the 14th while Mercury reaches 22° west of the Sun on the 24th but is swamped by our morning twilight. 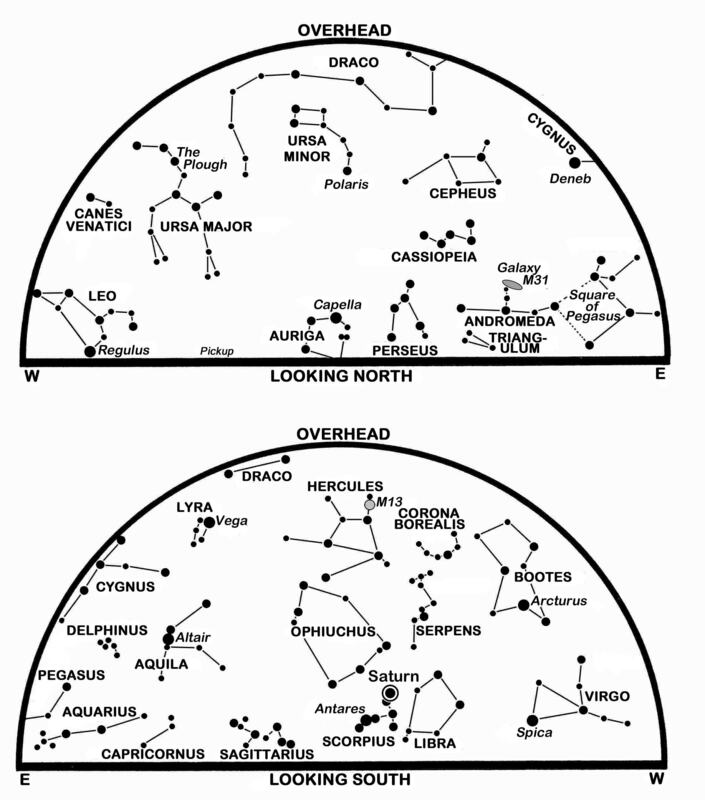 The constellations of Hercules and Ophiuchus, both sparsely populated with stars, loom in the south at the map times while the Summer Triangle formed by Vega, Altair and Deneb is high in the east to south-east. 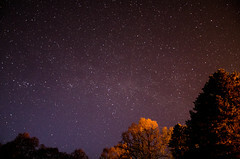 Were we under darker skies a few degrees further south, in southern Europe for example, then we might spy the Milky Way flowing through the Triangle as it arches across the eastern sky from Sagittarius and Scorpius in the south. 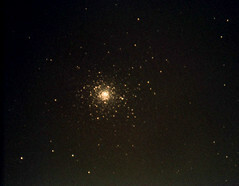 The latter are rich in stars and star clusters, but they hug Scotland’s southern horizon where only the bright yellowish Saturn and the distinctly red supergiant star Antares, half as bright and more than 11° below-left of the planet, stand out. Saturn stood at opposition on May 23 but is still observable throughout the night as it moves from the south-east at nightfall to the south-west before dawn, peaking only 16° above Edinburgh’s southern horizon thirty minutes before our map times. As the planet edges 2° westwards in eastern Libra, it tracks away from the fine double star Graffias in Scorpius, below and to its left. Look for it close to the Moon on the evenings of the 1st and 28th. This month Saturn fades a little from magnitude 0.1 to 0.3 but remains a striking telescopic sight. Its iconic ring system is tilted 24° towards us and spans 42 arcseconds around the rotation-flattened 18 arcseconds globe. On the opposite side of our sky to Saturn is the star Capella in Auriga which transits low across the north from the north-west at dusk to the north-north-east before dawn. It is in this region of our sky that we sometimes see noctilucent clouds. Appearing like wisps, ripples and sheets of silvery-blue cirrus, these form as ice condenses around particles near altitudes of 82 km where they glow in the sunlight after our more familiar weather or troposphere clouds are in darkness. Best seen from latitudes between 50° and 60° N, ideal for Scotland, they appear for just a few weeks around the solstice, from about mid-May to early-August. This is a slightly-revised version of Alan’s article published in The Scotsman on May 29th 2015, with thanks to the newspaper for permission to republish here.